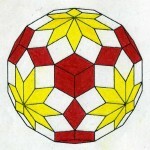 As mentioned in the body text, the rhombhectotriadiohedron (i.e. 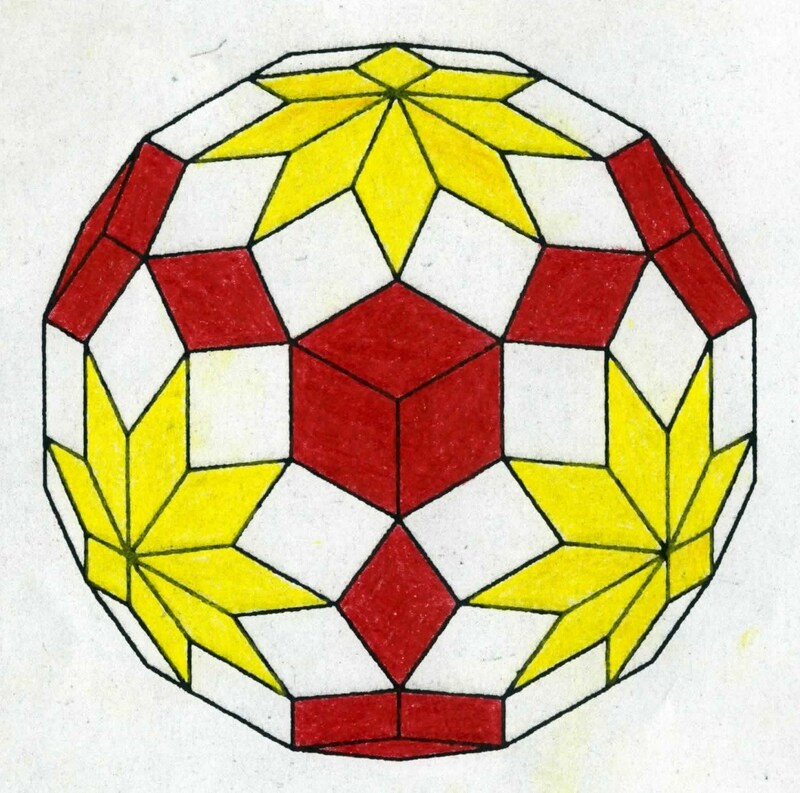 rhombic polyhedron with 132 faces) is of two types (T and C) and each one is composed of three kinds of rhombus. Please Refer to Figure 1 and Figure 2. My current task is to calculate the angles of these rhombuses by myself. Star Zonohedra” is considered to be highly instrumental in figuring out these angles. It describes the way to build the equilateral-zonogon, star-zonogon, equilateral zonohedra and star zonohedra. First of all, basic plane figures or solids to be used for such formulation are specifically selected. While the basic plane figures or solids to be used vary depending on the equilateral-zonogon, star-zonogon, equilateral zonohedra and star zonohedra to be built, they are either regular polygon (2D), regular polyhedra, quasi-regular polyhedra, or compound of regular polyhedra and quasi-regular polyhedra (3D). Then, base vectors are successively drawn from their center to their respective vertices. The basic solid to be used to build the rhombhectotriadiohedron of T-type are either the truncated tetrahedron or the small rhombicuboctahedron. On the other hand, the one for the C-type is the truncated cube. In case of the truncated tetrahedron, a whole solid is to be used. In case of the small rhombicuboctahedron and the truncated cube, one half of solid is to be used. Please refer to Figure 3. The number of base vectors in these cases is 12, which is common to T-type and C-type. Mr. Watanabe kindly provided me with the following additional advices. The rhombohedra or equilateral hexahedra can be created from three base vectors selected. The quantity of these rhombohedra or equilateral hexahedra thus created is equal to the number of combinations selecting 3 from 12. They include duplications and, therefore, we select only those independent from each other. Then, we make their paper models and put them together successively in accordance with the configuration of base vectors. The foregoing is understood to be a method to formulate the rhombhectotriadiohedron (T-type and C-type). If such formulation is successful, the angle of rhombuses in question will be easily calculated. This is my current homework yet to be done. If it is successfully conducted, a result of it will be uploaded shortly thereafter. Thank you for your positive comment. I will try to continue providing enlightening and interesting information in my website. This post Orion Research Institute for Metaphysics » Blog Archive » Sacred Geometry: Formulation of Rhombic Polyhedron with 132 Faces (Rhombhectotriadiohedron) was a good read so I Tweeted it to hopefully give you more readers. thanks. Thank you for a favorable comment. Your support is highly appreciated. After looking at a handful of the blog posts on your web page, I honestly like your way of writing a blog. I saved as a favorite it to my bookmark site list and will be checking back in the near future. Please visit my website as well and let me know how you feel. Thank you for your encouraging comment. I have just uploaded a new article on the sacred geometry. Please be sure to read it. I didnt seek this, but I enjoyed this, found it interesting! Keep up the awesome work! Thank you for your positive comment. I am pleased to know that you enjoyed my website. Which kind of content are you referring to? I always mention the source of my information in each article. My pleasure. I will try to continue providing valuable information. Thank you for your comment. I will try to maintain the quality of my website. Thank you for your positive comment. I am in the process of making a model of the rhombic polyhedron with 132 faces. If it is successfully done, I will upload a new article on it. Hey There. I discovered your weblog using msn. That is a very smartly written article. I’ll be sure to bookmark it and come back to learn extra of your useful info. Thank you for the post. I’ll certainly comeback. Many thanks for your encouraging comment. I have just uploaded a new article on the sacred geometry. Greetings for a beautiful summer day. Enjoy visiting my website. I was extremely pleased to uncover this great site. I need to to thank you for your time due to this wonderful read!! I definitely appreciated every bit of it and i also have you book-marked to look at new things on your site. It is also my pleasure to know that you have enjoyed visiting my website. I will continue providing good-quality articles. Thank you for your comment. I am pleased to know that you find my website valuable and instrumental. Howdy very nice website!! Man .. Beautiful .. Superb .. I will bookmark your web site and take the feeds also¡KI’m happy to seek out so many useful info here in the publish, we need develop more techniques in this regard, thanks for sharing. . . . . . Thanks for your nice comment. You can certainly expect to find more interesting information in my website. Thank you for sharing superb informations. Your web-site is so cool. I’m impressed by the details that you¡¦ve on this web site. It reveals how nicely you understand this subject. Bookmarked this web page, will come back for extra articles. You, my friend, ROCK! I found just the info I already searched everywhere and simply couldn’t come across. What a perfect web-site. Thank you for your favorite comments. 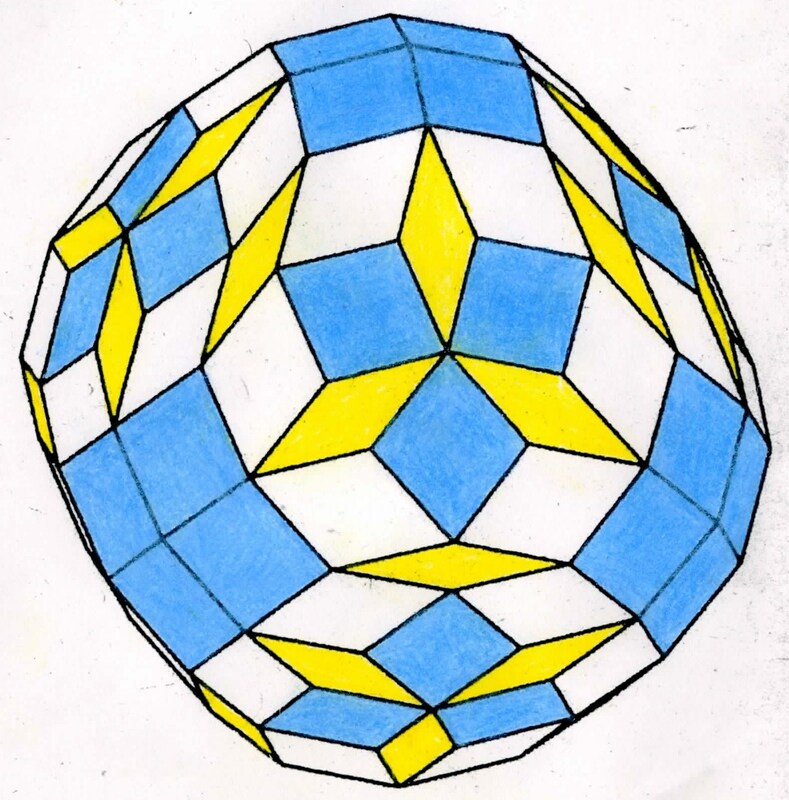 Concerning the rhombic polyhedron with 132 faces, I will certainly provide further information as soon as I have succeeded in making its paper model. I definitely wanted to make a quick remark so as to appreciate you for those amazing hints you are sharing here. My rather long internet investigation has now been honored with awesome content to share with my great friends. I ‘d state that that most of us site visitors are quite endowed to live in a really good website with very many brilliant people with good opinions. I feel somewhat privileged to have seen your entire web pages and look forward to many more thrilling moments reading here. Thanks a lot once again for everything. Many thanks for your encouraging comments. It really is my pleasure to know that my website is of some value to you. I will continue providing good-quality information. Thanks for your positive comments. I am glad to know that you enjoy visiting my website. Thank you for your compliment. I will do my utmost to continue maintaining the quality of my website. Hello! Yes, I am quite sure of what I provide in my website. I always mention the source or reference. Can I use information from this site to your blog? They are very useful. You can use the information from my website with a proviso that you specify the information source. Thank you for your positive comments. I will do my best to continue uploading information that is of some help to you. When I discovered your website I got therefore pleased, its the rainforest available on the internet and there are 99 % bad websites without any content as well as relevant info, however, you go the other method and provide all of us reading in right here knowledge about a lot of nutrients! Thank you for your favorable comments. I am pleased to know that my website is of some value to you. I will continue providing good-quality information. cheers for taking the time to discuss this, I feel strongly about it and really like learning much more on this topic. If possible, as you gain expertise, could you mind updating your blog with much more details? as it is incredibly valuable for me. Thank you for your encouraging comment. I am uploading a new article on the sacred geometry shortly. If you have keen interest in some specific subject, please let me know. I will see if I can provide more details on it. Most of whatever you claim happens to be supprisingly accurate and that makes me ponder the reason why I hadn’t looked at this in this light before. Your piece truly did turn the light on for me as far as this specific topic goes. Again, thank you for your comments. I will be uploading a new article on the sacred geometry soon. Please visit it when you have time. I really like this weblog, fantastic content material and I am going to bookmark this web site for future updates. Thank you for your admiration. No, I did not make my website by myself. It was designed by professional people in Japan in compliance with my requirements. In reply to your comment, I will say that the information on the sacred geometry is provided to everybody from beginners to experts who are interested in this subject. Throughout this great design of things you secure an A just for effort and hard work. For the moment I will, no doubt yield to your position. I just want to tell you that I am just very new to blogging and site-building and absolutely liked you’re web site. More than likely I’m likely to bookmark your blog post . You absolutely come with superb article content. Thanks a bunch for sharing with us your web-site. Thank you for your compliment. I am so glad to know that you liked my website. I am just an amateur in creating a website, so I utilized services from an established professional IT company in Japan. I suggest that you do the same. Just wanted to drop you a quick line to say how much I enjoyed reading Orion Research Institute for Metaphysics » Blog Archive » Sacred Geometry: Formulation of Rhombic Polyhedron with 132 Faces (Rhombhectotriadiohedron) , I will certainly pop back again shortly. I simply want to tell you that I am just new to blogs and seriously enjoyed you’re page. Likely I’m planning to bookmark your blog post . You amazingly have terrific article content. Kudos for sharing with us your web-site. Thank you for your comment. Yes, I am convinced of what I present in my website. In this grand design of things you’ll receive an A just for effort. For right now I will yield to your issue. Thank you, I have recently been hunting for information about this subject matter for ages and yours is the best I have discovered so far. Have you given any thought at all with converting your current blog in to French? I know a several of translaters right here that will would certainly help you do it for free if you wanna get in touch with me personally. Thank you for your comment and question. As you know, my website is currently in 3 different languages, i.e. English, Japanese, and Spanish, though the Spanish contents are virtually limited to the front page and the “Silver Compass for the Earth Changes” page at present. I am in the process of preparing its Hindi version and Chinese version. They will be uploaded in the near future. I did not consider the possibility of adding its French version just because of cost. If I can do it without any cost impact, I really want to do so. Thanks for your personal marvelous posting! I actually enjoyed reading it, you are a great author.I will remember to bookmark your blog and definitely will come back someday. I want to encourage you continue your great posts, have a nice evening! Thank you for your nice comment and admiration. An cool blog post there mate ! Thanks for the post ! Oh man. This blog site is cool. How can I make it look like this ! Nice post ! Thanks for, commenting on this blog page man. Ill message you again. I did not realise that! This website has some really useful information on it! Thanks for informing me! I don’t even know the way I ended up right here, however I thought this publish was good. I don’t understand who you are however definitely you’re going to a well-known blogger should you aren’t already. Whoa! Тhis blog looks exactly like my old one! Thank you for your comment. Unfortunately, I have been unable to update my website for some time as I had to spend almost all of my available time for my mathematical study. Fortunately, I was able to complete its first stage, making it possible for me to make an update of my website. Of course, I will continue providing the latest useful information in it. Thank you for your comment. No, I don’t have such tips. If I find any effective way to make it happen, I will employ it right away. Thank you for your comment. 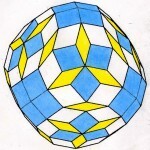 Concerning the rhombic polyhedron with 132 faces, a good progress has been made in my study. I will upload a new article on it in the near future. It will probably be sometime early in 2015. I am in the final stage of preparing a mathematical paper regarding the mutually complementary relationship between the golden ratio and the silver ratio. It is to be contributed to a leading U.S. mathematical journal. When it is successfully placed in it, I will also upload it in my website.